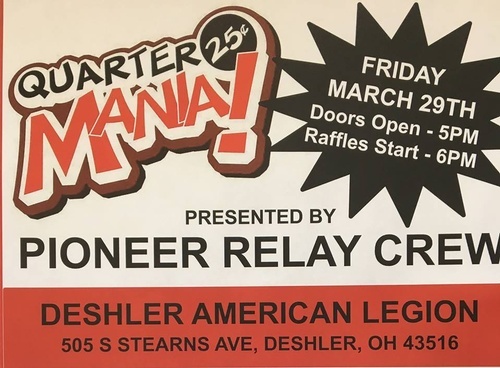 Pioneer Relay Crew will be hosting a Quarter Mania on March 29th @ Deshler American Legion. Doors open at 5 pm and Raffles will begin at 6 pm. Bidding paddles can be purchased at the door ($5 for 1 paddle or $10 for 3 paddles). We will also have side raffles and 50/50 drawings. Food and drinks will be provided by the Deshler Legion. All proceeds will be donated to Relay for Life of Henry County.